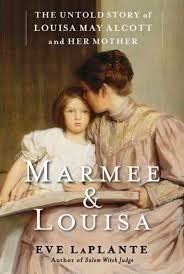 a book chick: "Marmee and Louisa"
my take: Every year at Book Chicks book club we read a biography or autobiography. And every year we're all glad we read it ... when it's over. The knowledge is great, most times the reading experience is so-so. So with a bit of dread I began Marmee and portioned off the chapters so I could stay on track to read it in a week and maybe get some other reading done. I was pleasantly surprised to find this very readable as far as the writing went. It was relatable and more conversational than scholarly. And not blasted long. The difficultly was that Marmee's husband and Louisa's father - Bronson Alcott - made life for them so miserable that it was exhausting and depressing to read about their hard-scrabble lives. And I was waiting for the part about Little Women. Which happens in the last quarter of the book. The author is a cousin a few generations removed to Louisa; letters in her attic were her inspiration and she certainly wrote from a perspective of love and admiration. So glad to have read this!